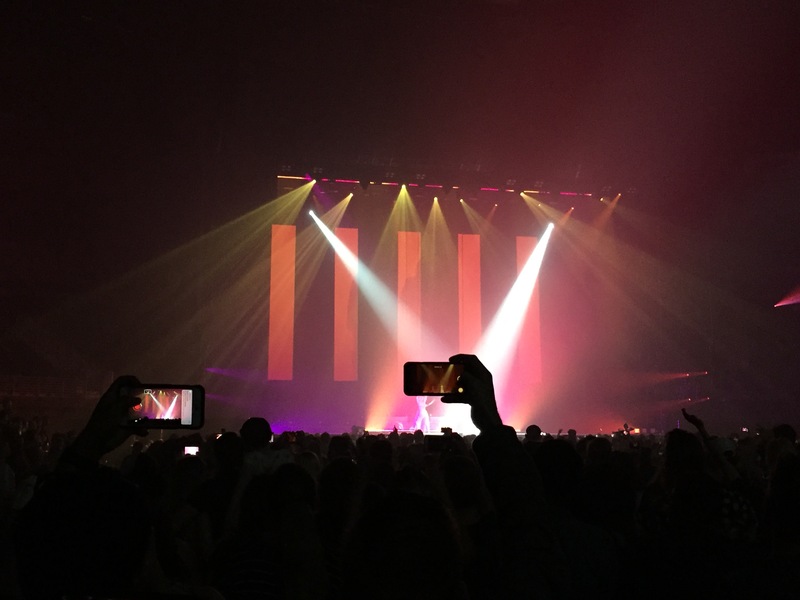 This past weekend my family and I drove six hours to Duluth, Georgia, to see singer/songwriter Lorde in concert. The night was everything I’d hoped it to be—dynamic, captivating and of course, loud. There were also a few pleasant surprises, like how I was able to find a front parking space at the Infinite Energy Center, where the concert was being held, or the fact that Lorde sang every one of her hits and then some, including “Yellow Flicker Beat” off the Hunger Games: Mockingjay Pt. 1 soundtrack (It was crucial I hear that song by the end of the night). But what really surprised me was what grabbed my attention multiple times throughout the night, and I’m not talking about the performance itself. Not the interpretive dancers. Not the flashing lights. Not the thousands of white paper stars that showered over the crowd towards the end (though that was pretty neat). I couldn’t take my eyes off the visual graphics that accompanied every song and performance. The lines! The angles! The gigantic Lorde! The set design for Lorde’s Melodrama Tour 2018 was truly mesmerizing. As the concert went on, the visual graphics became more complex, incorporating video clips timed precisely to the music and dance performances. As a designer, I couldn’t help but draw inspiration from what I was witnessing. I wrote this post because I want readers to think about the unlikely places we can derive inspiration from when we create something. Whenever I need to reset my imagination, I turn to my favorite movies (the more surreal, the better), or I find new music to listen to, which allows my mind to wander and discover new creative territory. Occasionally I’ll browse other designers’ portfolios and websites to become inspired. Also, it helps to switch up your sources for inspiration so you can avoid hitting a plateau and falsely believing you’ll never feel inspired again. Either take a break from the project you’re working on or look elsewhere for inspiration, but always, always try. And if you ever find yourself in a Georgia town six hours away from home watching a concert performed by your favorite New Zealand artist, I suggest taking notes on the visuals.